Spring and Easter are all about family, friends and new beginnings. This positive time of year is the perfect occasion to reveal that you are expecting a baby. There are so many cute and creative ways you can tell all the people that mean the most. 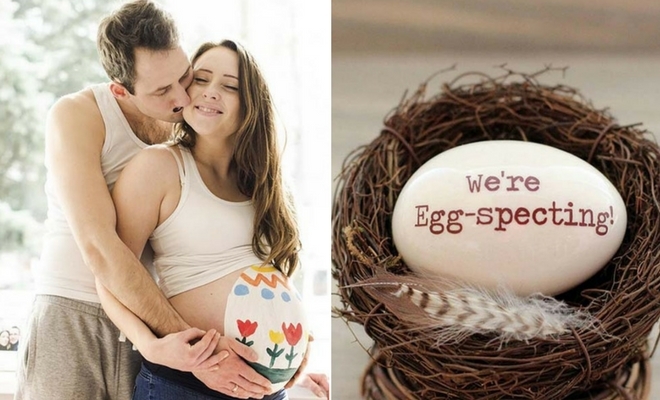 To give you some inspiration we have found 21 Easter pregnancy announcement ideas. We have something for everyone from photo shoots to Easter eggs! First up we have this super cute we’re egg-specting egg! This egg is ceramic and can be kept as keepsake. You could take a fun reveal photo with an egg like this or have it as a decoration during Easter celebrations. 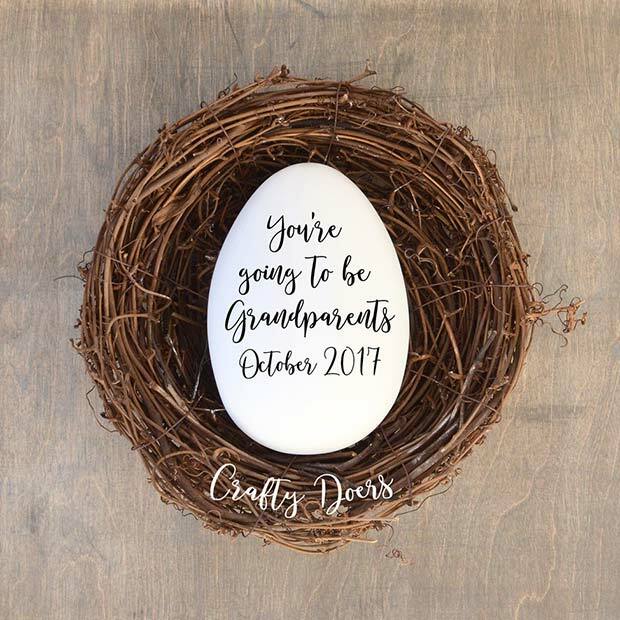 This little ornament is perfect for an Easter pregnancy reveal. 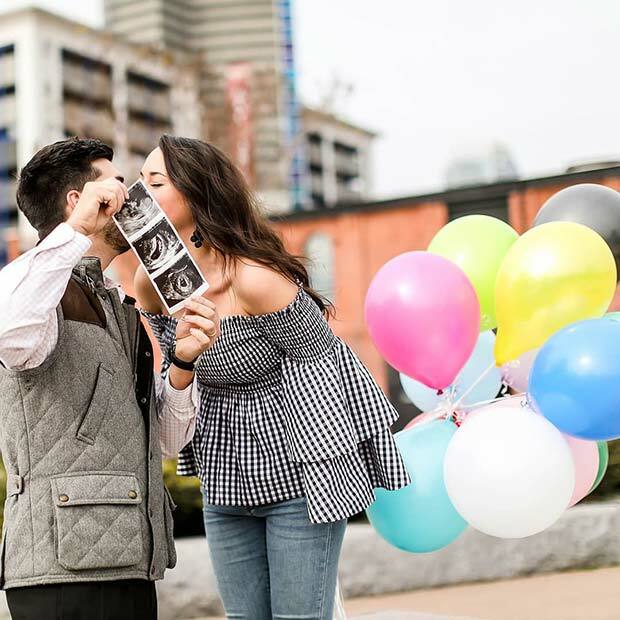 Many couples choose to have a photo taken when revealing a pregnancy. For an Easter reveal you could take a photo like this one. The mom-to-be has her baby bump painted like an Easter egg. This is a super cute idea and you could have any Easter design created. 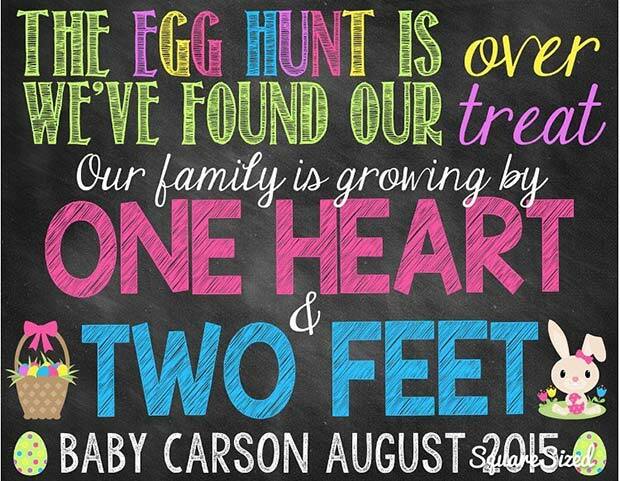 Chalkboards are very popular for pregnancy reveals. You can have anything wrote on them and they are great for photos. This next idea is perfect for Easter. It features a quote about egg hunts and about how the family is growing. You could have a sign like this created and have it personalized with your own name and date. Next, we have another cute couple’s photo shoot idea. Dad is holding scan pictures and mom is holding balloons. An idea like this would be perfect for Easter as the balloons are in pastel colors which is perfect for the season. You could recreate something like this easily and it will be a great memory to look back on. Easter is associated with eggs, birds and nests. Our next idea uses this theme in such an adorable way. 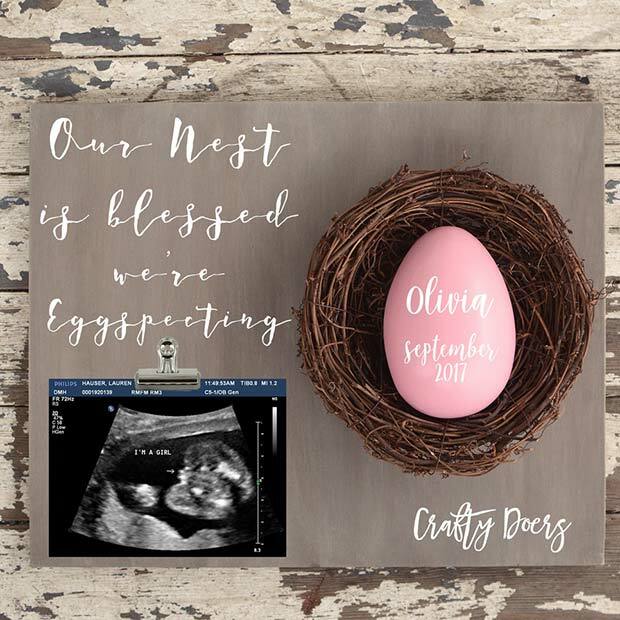 The reveal photo features a personalized egg in a nest with a scan photo and the quote our nest is blessed. 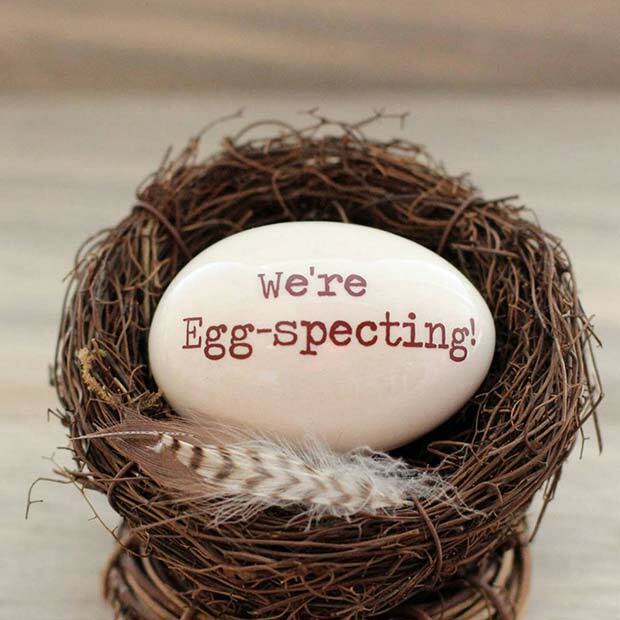 This is a creative and cute way to share your news and you can make the egg blue or pink to reveal the gender. Spring is the season where bright flowers start to regrow after winter. You can use a spring floral theme for your Easter pregnancy reveal. 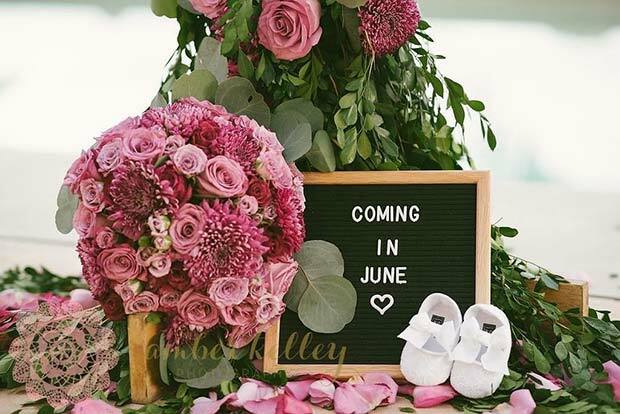 You could create a photo like this with flowers and a board with the due date. As it is Easter you could use daffodils and add in some decorative eggs. Daffodils are the flower of spring and Easter, so these flowers are perfect for an Easter pregnancy reveal. 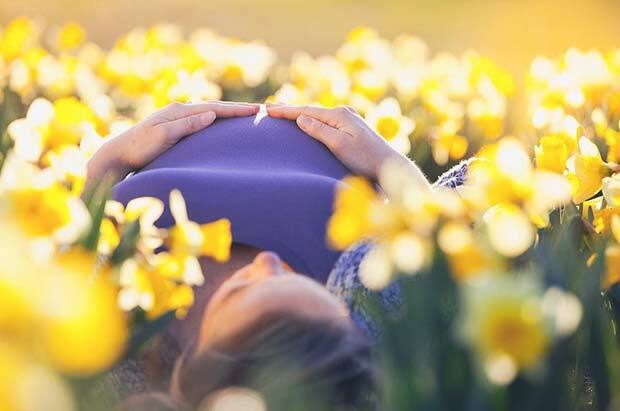 This mom-to-be has had her photo taken in a field full of daffodils and it is a simple but beautiful idea. Not only is it a way to share your news, it will also be a great memory to look back on. Telling your parents that they are soon to be grandparents is very exciting. This next idea shows how you can tell them over Easter. Here we have a decorative egg with “you’re going to be grandparents” with the due date. Any grandparents-to-be would love to receive something like this. Earlier in the post we featured an Easter reveal chalkboard. This next idea shows how you can use a chalkboard to create a super cute photo. 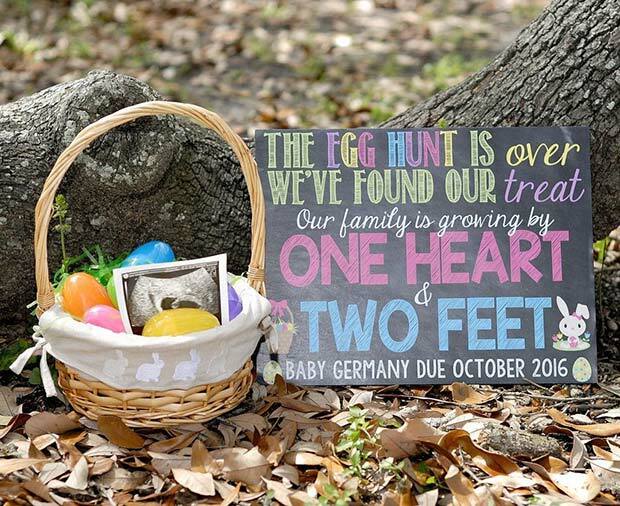 The board has been placed with an Easter basket and a scan photo. This would be simple to recreate, and all your family and friends will love it. If this is your second child, you can get the siblings involved in the announcement. 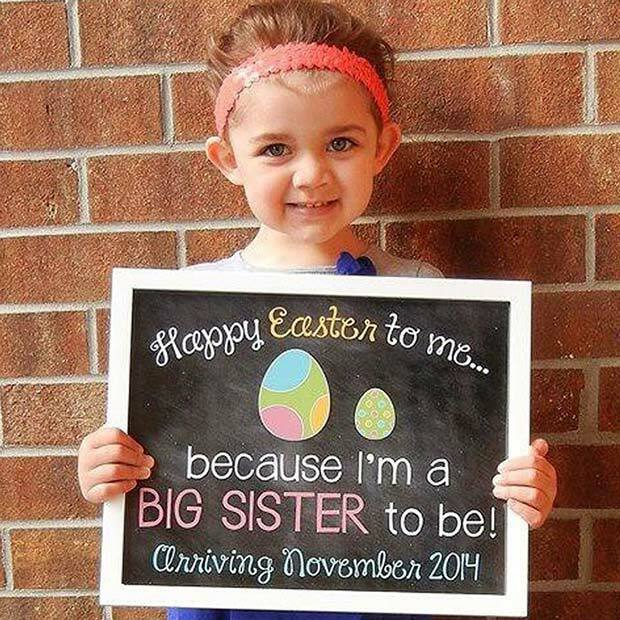 This next idea features a board that reads “happy Easter to me because I’m a big sister to be”. A photo like this is perfect for Easter and it will be a great memory to look back on.